It’s 10 a.m. and sirens are blaring throughout the country of South Korea reminding its citizens to take a moment to pray for, mourn and honor the fallen service members who gave the ultimate sacrifice in service to their country. This moment of silence happens every year on June 6 in honor of South Korea’s Memorial Day. 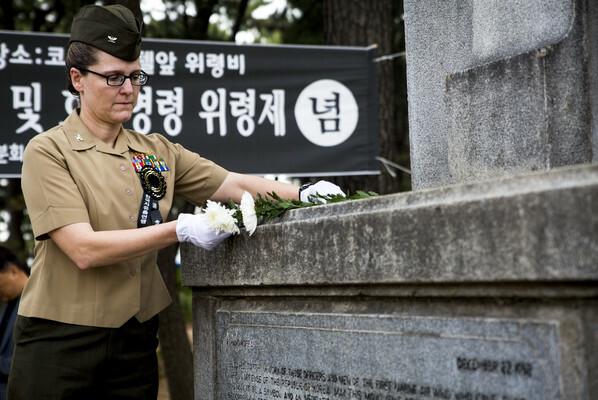 This year, the Republic of Korea and U.S. paid tribute to the service members of the Korean War during a memorial ceremony at Pohang City Battle Monument and 1st Marine Aircraft Wing Memorial Monument in Pohang, South Korea, June 6, 2018. 1st MAW sent two representatives to join the ceremony, U.S. Marine Col. Maria McMillen and U.S. Navy Capt. Denis Cox. Four Marines stationed on Camp Mujuk, the sole U.S Marine Corps base in South Korea, also took part in the ceremony. “This memorial here represents the unique and unwavering alliance between the Republic of Korea and the United States and reminds us of the bond and brotherhood that has been established between our nations – not only during times of war, but every day as we unite for freedom and democracy,” said McMillen, the G-5 assistant chief of staff with 1st MAW. The event attendees consisted of ROK Marines, city council members, Korea Freedom Federation Songdo Branch members, local police officers and the Pohang police chief, as well as many local bystanders. Cox, the 1st MAW wing chaplain, said he was grateful to participate in this memorial and meet the other participants. He was also fascinated to see the Korean tradition to honor the fallen. During the ceremony, the locals set out a variety of food on an altar in front of the memorial. A smaller table holding an incense burner and a tray of wine was placed in front of that. Next, an individual knelt at the small table to light the incense. After, they pour two cups of rice wine into a bowl to symbolize their ancestor’s descent to the offering table, stood up and bowed deeply. This process was then repeated by others who wished to join. McMillen participated in this ritual as well and also placed a white flower on the 1st MAW Memorial Monument. Each participant at the memorial followed suit. “Observing Memorial Day should remind us to be humble, thankful and never take for granted the sacrifice that was made by so many people in the past to ensure our way of life today,” said McMillen.